It's a crazy alien dance party and you're invited! How good are your visual skills under pressure? For The Twin is a game about learning to recognize creatures that are alien to you in a variety of fun environments and challenges. A game intended for both adults and kids to enjoy! Added two new chiptune loops bring total to 5 in game and 1 menu loop. Major overhaul of the music sampling rate and sound effects sampling rates. Also did another pass on balancing music and sound effects volume. Cut init time down to 3 seconds from 4. BUG FIX: The penalty visual flash on time UI wasn't clearning right, also standardized it to red. Made it so every song will play in a random order without repeating until they have all played. This way I can add more tracks and people won't get repeats till they've heard them all at least. Currently just 3 loops and one menu loop. Composed 5 new 30-40 second chiptune loops and put them in the game! Fixed version string mess up on pause menu. Discovered I was only using 3 of 6 available jump/happy noises and made sure they are all active now. Added a limiter to the amount of happy noises that will play because on levels with 10+ creatures it is a little overwhelming/annoying when they all go off combined. BUG FIX: Challenge complete screen had two bugs with how it was displaying the star medals--should be correct now. The challenge select screen was correctly displaying the medals though. Major version number bump because this thing is almost finished and I need playtesting feedback on how far/fun/easy/hard people are finding the six challenges. Implemented all the various UI/Menu stuff to support challenge unlocking and various player notifications. Made a quick change because of major performance issues I noticed on my older test laptop. Backgrounds and creatures currently won't be color transforming until I can further determine what the heck is up with the lag. Removed background fade to gray. Added SWFStats to gather useful play analytics data to study gameplay and improve it! Next: More creatures and other art! 6/29: v0.1 posted! Managed to spend about 9 hours today getting the first playable prototype finished. It let me prove out some of my concepts with more to come tomorrow! 6/28: picked my case art! I'm looking forward to playing as the squatting guy in the bottom right. He caught my eye as well! Top left guy felt like a protagonist to me. As I vaguely tried to hint at in the game's description above I am probably going to try and base the game on visual recognition mechanics. 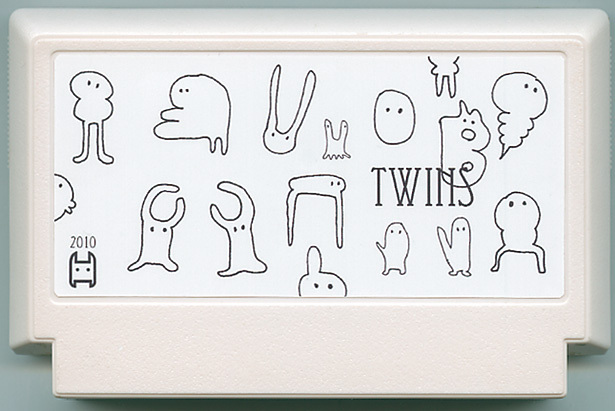 I hope to make a small, fun, and simple visual recognition game (not a "memory" game though) that will feature heavily stylized and humorous sounds, animation, and line art drawings of the various Twins. I am starting to imagine various mechanics to increase the difficulty as levels progress. Starting off with smaller amount of creatures perhaps I can introduce dopplegangers where you will have to watch for a particular quirk or 'tick' of personality to correctly identify the other twin. Initial basic idea of score being tied to how quickly your aggregate game time goes on finding all the lost twins across the levels with penalty time given for selecting wrong creatures. I hope to find some fun twists along the way and since I don't have a ton of time this month because of a couple other game projects I needed a game scope that was small. I'll keep posting updates as I go though. ahaha these guys are great. I look forward to what you do with it, HybridMind. Alrighty.. got up early today and time to get started on this game. First up breaking out the tablet to do my own take on creature art for the game. I think I want to still keep it B&W line art style because that is what caught my eye in the first place about 'Twins'. I wrote down a bunch more of my ideas since last night and sleeping on the concept as well and I'm excited about implementing this game. Hope it turns out fun! My current thinking is that I will create a whole bunch of Twin subtypes. Then I can pick at random from any subtype and I can intelligently populate the remainder of the screen with look alikes from that subtype which should add to visual distraction. I can of course also add some fun twins from other subtypes too. I plan on having each drawing have an idle animation and maybe a "twitch" animation that will be used later perhaps but that will be there initially for visual fun only. Here is a little animation test I threw together demonstrating 4 frames of animation across 6 variants of twin type #1. These look great! I don't suppose you'll have them walking around? I don't know whether that would make the challenge in your idea too hard, but I would love to see a whole screen of these guys wandering around and carrying on. I am hoping to experiment with them occasionally wandering. I do worry it may make it a bit hard but depending on how I do the levels on this there may be some levels that just feature wandering as the prime deterrent. Managed to spend about 9 hours today getting the first playable prototype finished. It let me prove out some of my concepts with more to come tomorrow! Can't wait to work more on this tomorrow and add even more crazy creature types!!! It's like where's waldo except slightly unsettling. I hope at the end it will be REALLY unsettling. #3 and #4 look a little too similar, I think. Oh I know I HATE those guys! Currently it doesn't pick the Goal from #s 5 and 6 though because I found them to stand out way too much. You can only get 1-4 currently and it uses the remainder as distractions. Once I get more animating creatures in tomorrow I'll be continuing to test what is fun/annoying along with a few other mechanics for scaling difficulty as well as interest/attention from the player. I hope to support MANY of the creature types from the Famicase art along with their eerie variants. Looks amazing! The game was actually surprisingly fun. Amazing how you got it made so fast. That was actually fun. I got the second highest score in the world on it. :D 1:34 min. WOOT! I like these kinds of games. Extremely simple and a pleasure to play. levelbylevel.com | Play Stabilize! | Play Splatz!